The other day a blog I follow asked the question “What literary character would you like to have a beer with?” Naturally, I thought about it, and I came up with a host of people that I would love to hang out with, drink a beer with, and just sit around swapping stories with – if these guys actually existed of course. When trying to weed my list down to a manageable ten, I couldn’t get there. I did find a way to get to eleven, but even then, I found that there were some fantasy and science fiction characters that just had to be put together, because I could not imagine handing a beer to one without the other being there waiting for theirs, so you will notice that in my list there are groups of people as well as individuals. Perhaps this is cheating, but it is my list, and I get to set the rules. 11. Count Renato Biagio of John Marco’s Tyrants and Kings trilogy. Some character believe themselves to be devious. Whether they use this deviousness for good or bad is somewhat irrelevant. Biagio is definitely in the upper echelon of the “Devious Characters” club. He is one of those people who puts things into motion and sits back watching as his multi-layered plans begin to unfold like a piece of paper being turned into an origami masterpiece. Hell, Biagio is so devious even his spies do not know how many other spies are spying on them. The dude has a mind like a spider weaving a lethal web, and I’d love to sit around and listen to him give me the inside scope on one of his Ocean Eleven type plans — if he didn’t kill me first. 10. Royce and Hadrian of The Riyrian Chronicles. The fantasy buddy duo for the twenty-first century. Royce is the slit your throat in a heartbeat type, while Hadrian is the amiable one, who wants to become your best friend. Together, they are interesting and absolutely hilarious, especially when they start arguing with one another. After a few beers, I’m sure they would be great fun to chat with. 9. 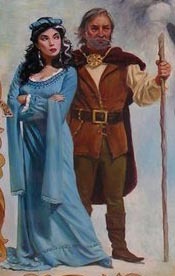 Belgarath the Wolf and Polgara the Sorceress. 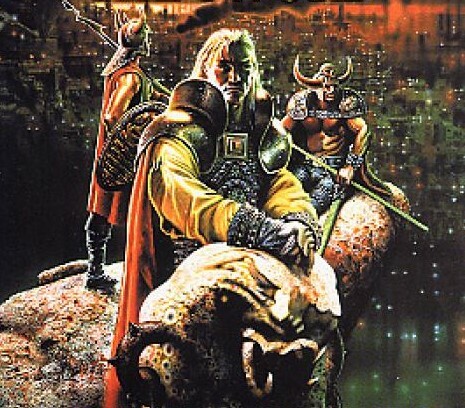 I fell in love with David Eddings’ characters when I was a teenager, and my adoration lasted into my early twenties. After all these years, I still think of all the guys and girls and gods in The Belgariad and The Mallorean as my old friends, so if I was going to drink a beer and swap lies with someone, I have to include Belgarath, because he is the ultimate storyteller, and Polgara, because not only is she beautiful and bossy and sharp tongued but — I also had a huge crush on her when I was a teenager (There I admitted it.) Getting together would be like going to my twentieth high school reunion again. 8. 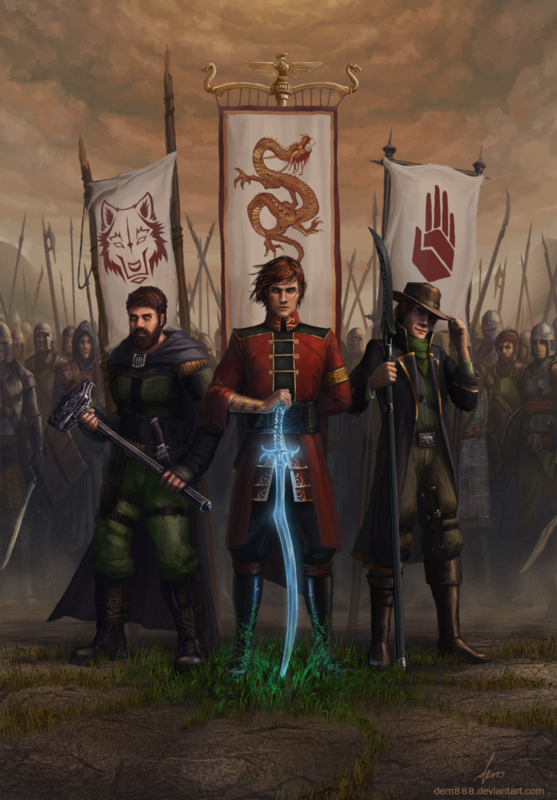 Rand, Perrin, and Mat from The Wheel of Time. Even though I have not had the courage to finish this epic fantasy series, I’d love to have these guys tell me all about their fun times growing up in the Two Rivers, their adventures in their previous lives, and explain to me why their story had to be drug out over fourteen books. Hell, I’ll even share notes with Rand about how no one understands women, and one of them can explain to me how I could ever trust an Aes Sedai. Maybe by the time we are finished with our chat, I will actually have found the courage and determination to start a reread of this massive series (even the middle books of their story where very little happens) and finish the Wheel of Time, which at one time was my second favorite fantasy of all times – just behind the Lord of the Rings. 7. 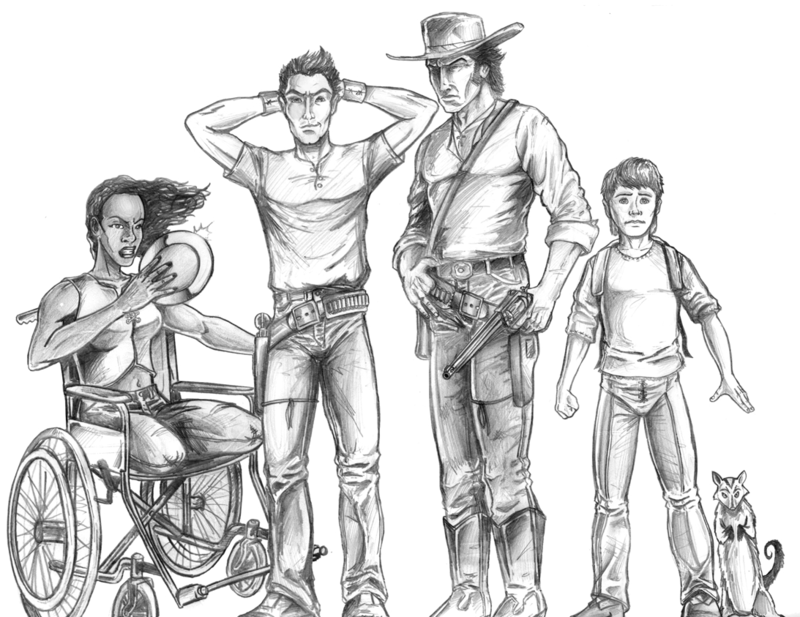 Roland Deschain, Jake Chambers, Oy, Eddie Dean and Susannah Dean. Stephen King, I have major problems with how you finished The Dark Tower saga. Hell, I now refer to the ending as the “Abyss of Bad Endings.” (Yes, I am in the process of copyrighting that.) But you know what I can’t complain about, Mr. King? I cannot say one bad thing about this group of memorable characters that you introduced me to. I love each and every one of them, and I would be honored to sit around a camp fire with them, drinking a beer and listening to the Gunslinger tell another story about the world before it moved on. 6. 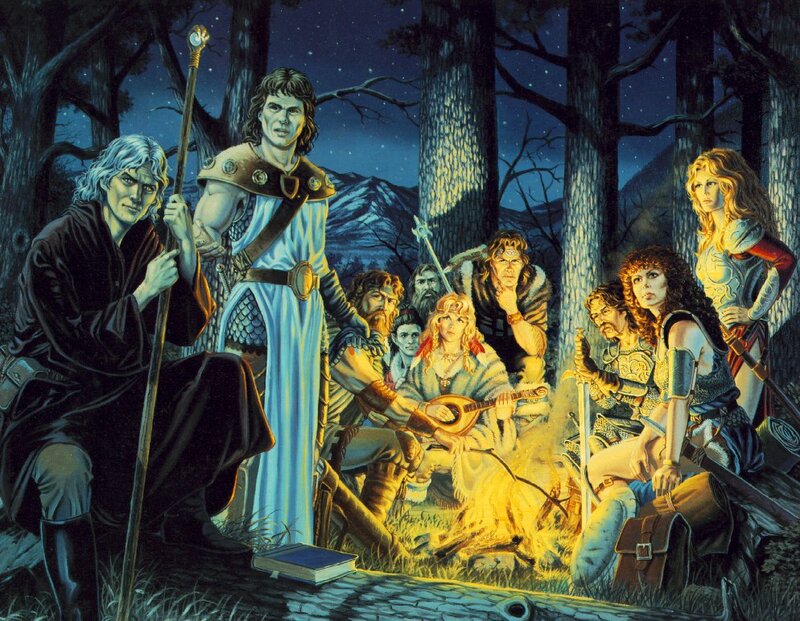 Caramon, Raistlin, Tanis, Sturm, Tasselhoff, Flint, Goldmoon, Riverwind, Lauranna, and Tika of the Dragonlance Chronicles. This is another group of people I grew up with. Perhaps we might not be friends if I met them now (I am much older and grumpier) but just like Belgarath and Polgara, these are people who helped me get through my awkward teenage years. Sitting around a table drinking beer with them would be just like hanging out with my high school buddies talking about old times. The stories would get bigger, and our parts in it more glorious, especially the more beers we drank. 5. Ingold Inglorion of the Darwath trilogy. If Gandalf is the epitome of wizardly class and wisdom, then Ingold is the pinnacle of wizardly badassy-ness. He will strike you down with magic. He will cut you up with a sword. If that doesn’t work, he will just cut you to ribbons with his tongue. His friends know he will be the last one to leave the fight, and his enemies recognize him as the person who needs to die first. He is wise, powerful, and one hell of a mentor. On top of all this, Ingold is the only one who might be able to save his entire planet from nearly invisible creatures called the Dark, whose meal of choice is humankind. Talk about a little bit of pressure. But even in horrible circumstances, everyone can always depend on Ingold, because he is the solid rock that will not fail. 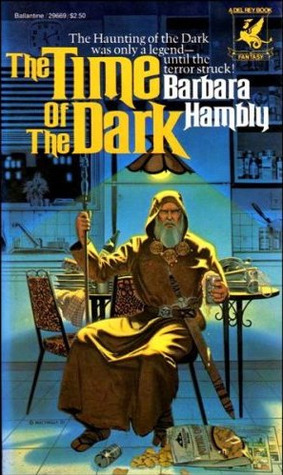 Sure, Gandalf is great, but has Gandalf ever been on a cover of his trilogy drinking a beer? Nope. But Ingold has, and that is why I’d love to drink a few and get Ingold to show me how to open a portal to another world. 4. Apollo, Starbuck, and Boomer of the original Battlestar Galactica. Yeap, another group of favorites from my childhood. While I loved the updated BSG from the last decade, my heart will always belong to this trio who blasted up cyclons before heading back to the ship for a game of pyramid and a good cigar. They laughed, loved, and basically made this Star Wars copycat one my favorite sci fi series of all times. Sure guys, I’ll have a drink, but no, I’m not dressing up in those ridiculous uniforms and playing triad with you. 3. 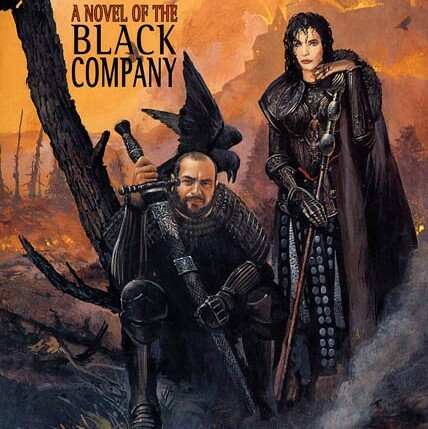 Croaker and Lady from The Black Company series by Glen Cook. Croaker is my kind of guy: loves history, seen it all, cynical about all the crap in life, and doesn’t mind getting his hands dirty. Along with Croaker comes his Lady, who is/was one of the greatest magic users of her world, conquered a continental empire, ruled the Taken (similar to the Ringwraiths), has a heart blacker than most yet has a tiny sliver of goodness hiding underneath all that black leather. Together, these two have always been my favorite fantasy couple, and I’d love to have a drink with them and just listen to them talk. Maybe, Croaker won’t even notice that I have a horrible thing for Lady. 2. 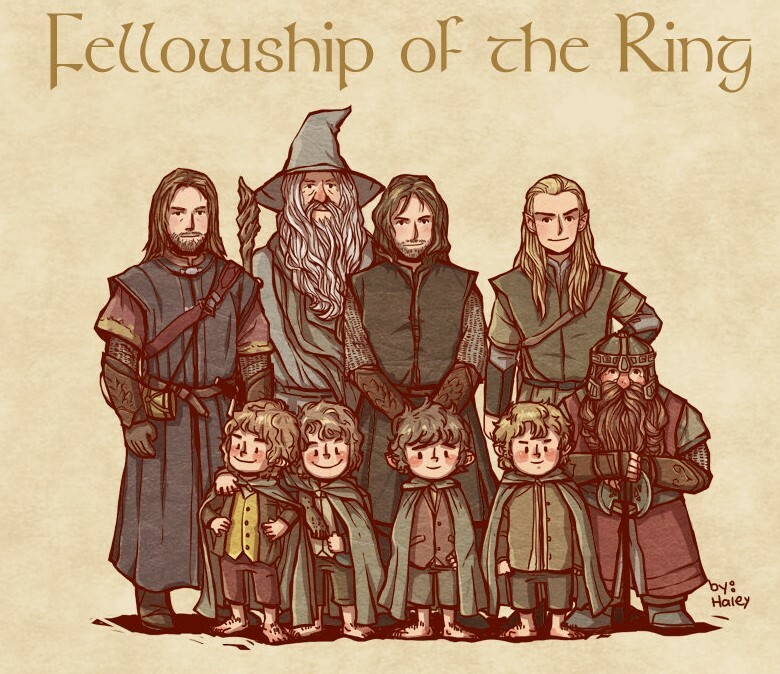 Merry, Pippin, Samwise, Frodo, Aragorn, Legolas, Gimli, Gandalf, and even Boromir of the Lord of the Rings. What could be better than sitting around in Rivendell with these guys, sharing a few and listening to some elvish poetry. So would I laugh with the hobbits, or would I participate in a drinking game with Legolas and Gimli? I could get Boromir to tell me some war stories from Gondor, or I could try to get Aragorn to come out of his shell and laugh a little bit. Plus, I would have to find time to talk to Gandalf, maybe even beg for a few fireworks from him. But mostly, I would just sit there star struck with this group of people who turned me into a fantasy fan for life. 1. 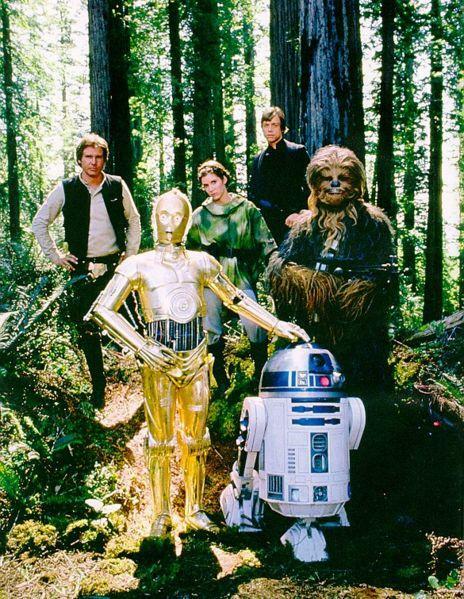 Han Solo, Luke Skywalker, Leia Organa, Chewbacca, R2-D2, and C-3PO. Cue the Star Wars music please. The ultimate group of buddies. They argue with one another, laugh together, and always have one another’s back. While the movies themselves may be showing their age, these characters will always be iconic to me, and I’d love to sit in a cantina somewhere and make a toast to them with my mug of Alderaan beer. Nuff said! That is my list. Who are your favorites? 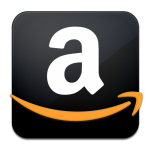 This entry was posted in Fantasy, Lists, Musings, Science Fiction and tagged Battlestar Galactica, Dragonlance, Gandalf, Ingold Inglorion, Lord of the Rings, Roland Deschain, Star Wars, The Belgariad, The Black Company, the dark tower, The Riyrian Chronicles, Tyrants and Kings, wheel of time. Bookmark the permalink. Han and Croaker from your list. But numero uno on my list would be a certain scamp in the city watch of Diskworld’s largest city. Thanks for reading the list, Nathan. I’ve never read Diskworld, though I’ve always said I was going to give it a try. Another good list from Bookwraiths whose choices will again intrigue and annoy for who’s on it and who’s left out. Just like it should. Thanks for reading the list and for the reblog, darkwriter67. What? No Lazarus Long? Wow, he should be at the top of the list (or bottom in this case)! Thanks for reading the list, No One! I had never heard of Lazarus until you mentioned him. After googling the name and reading about him, he sounds like an interesting character. Not sure I’d want to drink a beer with him, but who knows. Bilbo from Tolkien’s Lord of the Rings. Thanks for reading the list. I agree with every addition that you made to the list. Lol. Finally, someone who agrees with me. I am vindicated! Someone who agrees with ME! Its a match made in heaven (shh don’t tell my wife). im way late on this one…but i would have to say Gerald Tarrant…as scary as that may be..
Great list! I would heartily concur with Belgarath, the Heroes of the Lance, the fellowship and any Star Wars character at a cantina. I feel places can have personalities too. Tasselhoff Burfoot would be a lot of fun just for kicks, though I might be somewhat scared deep down to share an ale with Raistlin Majere, but his dark soul is what makes him so darn interesting. I thought this was fun. Who are your top 11? This list has lost credibility not having Tyrion Lannister. I totally agree. I need to add him. At the time I made this I wasn’t into Game of Thrones as much as I am now.